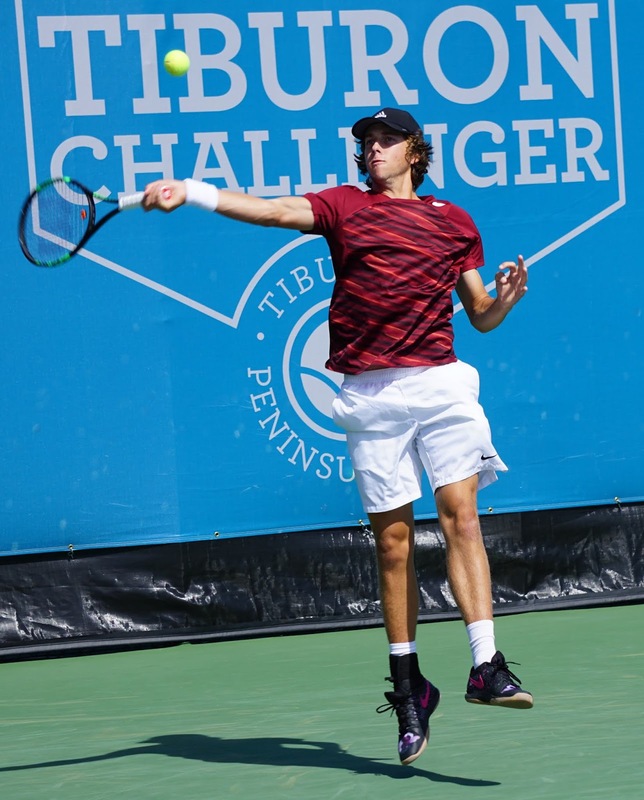 TIBURON, Calif. -- James Duckworth is lucky to be playing tennis at all, lucky to be in the main draw of the $100,000 Wells Fargo Tiburon Challenger and lucky to be in the quarterfinals. A big serve, mental toughness and experience also had a lot to do with the 26-year-old Australian alternate's nerve-wracking victory today at the Tiburon Peninsula Club. Duckworth, who underwent five -- yes, five -- operations from February 2017 to February this year, survived six -- yes, six -- match points to beat 19-year-old countryman Alexei Popyrin 4-6, 7-6 (2), 7-6 (6) in a 2-hour, 25-minute thriller filled with spectacular shots by both players. Only one of the match points came on Popyrin's serve. When asked how he pulled out the match, his first against Popyrin, Duckworth replied with a laugh: "I have no idea. I was down a few match points. I was just thinking one point at a time. I was thinking, don't make an unforced error; make him win the point. I got pretty lucky in the end. I'm thrilled to have won." Duckworth is scheduled to play Marcelo Arevalo of El Salvador on Friday. Arevalo, coming off a victory over second-seeded Jordan Thompson of Australia in the first round, defeated Mikael Torpegaard, a 24-year-old former Ohio State star from Denmark, 6-3, 0-6, 6-3 in a matchup of the top players from their countries. Torpegaard reached the semifinals of last week's $75,000 Columbus (Ohio) Challenger on his former home courts. In the other quarterfinal in the bottom half of the draw, fifth-seeded Michael Mmoh will meet wild card Tommy Paul in a clash of top American prospects. Both advanced by retirement. Mmoh, who reached the Tiburon final two years ago as an 18-year-old qualifier and won the Columbus title last week, led 6-2, 3-0 when compatriot Ernesto Escobedo quit with a hip injury. 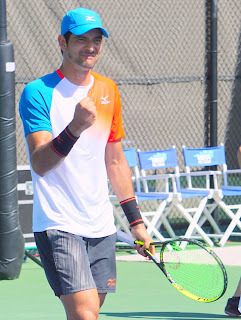 Paul, who won the 2015 French Open boys singles title and upset fourth-seeded Henri Laaksonen of Switzerland in the opening round this week, was up 5-0 when wild card Brandon Holt, a USC junior and the son of International Tennis Hall of Famer Tracy Austin, couldn't continue because a shoulder problem. In the doubles quarterfinals, Spaniards Gerard Granollers and Pedro Martinez beat wild cards and defending champions Andre Goransson and Florian Lakat -- former Cal teammates from Sweden and France, respectively -- 6-4, 6-4. Granollers is the younger brother of Marcel Granollers, the top seed in Tiburon singles. Duckworth escaped three match points while serving at 4-5 in the third set and three more when the 6-foot-5 (1.96-meter) Popyrin, last year's French Open boys singles champion, led 6-3 in the subsequent tiebreaker. Duckworth, a muscular 6 feet (1.83 meters), saved the first two match points with aces. Then Duckworth missed his first serve, but Popyrin netted a backhand return of the second delivery. With Duckworth serving at 3-6 in the third-set tiebreaker, Popyrin netted a backhand off Duckworth's net-cord backhand. Duckworth then blasted another ace and pulled even at 6-6 when Popyrin converted his first serve but netted a forehand. After Popyrin missed his first serve on the next point, he shanked a forehand off another net-cord shot by Duckworth, inducing Popyrin to yell in frustration, "How many net tapes?" Duckworth then converted his first match point with an overhead. Experience "definitely helped" Duckworth in the match, he said. "I was probably a little bit more composed than he was in those bigger moments, which probably got me over the line in the end," Duckworth surmised. matchup of the top players from their countries. Duckworth's spot in the main draw would have gone to countryman Luke Saville as a "special exempt" if he had won his quarterfinal in Columbus. That would have prevented Saville, then ranked No. 488, from playing in Tiburon qualifying. But he lost, opening a main-draw berth for Duckworth, the highest-ranked player at No. 289 to sign up for Tiburon qualifying. Got it? Duckworth attained a career high of No. 82 in 2015, reached the second round of a Grand Slam tournament for the fifth time in the 2016 U.S. Open and ended that year at No. 103. Then came surgery on his right foot in February 2017, right shoulder the following month, right foot in August 2017 and January this year, and right elbow in February. "I had a navicular stress fracture, and they put two pins in my navicular bone," Duckworth said of his foot injury. "From that, there were just different complications. I had pains in different areas, from what I can't really tell you. I had to have two more operations on my foot. "I also had shoulder and elbow issues that needed to be (addressed) at some stage, and we thought we may as well do them at the same time. The foot was the main thing that held me back for such a long time." It was all "extremely" frustrating, averred Duckworth, who used a protected ranking to return at the French Open in late May and lost to third-seeded Marin Cilic 6-3, 7-5, 7-6 (4) in the first round. "At the end of 2016, I felt like I was really playing my best tennis," he said. "I was pretty close to the top hundred, and I had no (ranking) points to defend for six months. I thought I could push for the top 50. "It was a terrible 18 months, really. I went through five surgeries and was doing lots and lots of boring rehab. I was struggling to get healthy. I was in pain for such a long period of time, and I couldn't run for so long because of my foot. It was really tough, but I had a great team that helped me back in Brisbane. I went through everything, and I'm really excited to be back out here playing again." Duckworth said he didn't consider retiring but "there were lots of times I thought I was never going to be able to run again. I didn't want to quit, but I thought my body might get the best of me." It didn't. 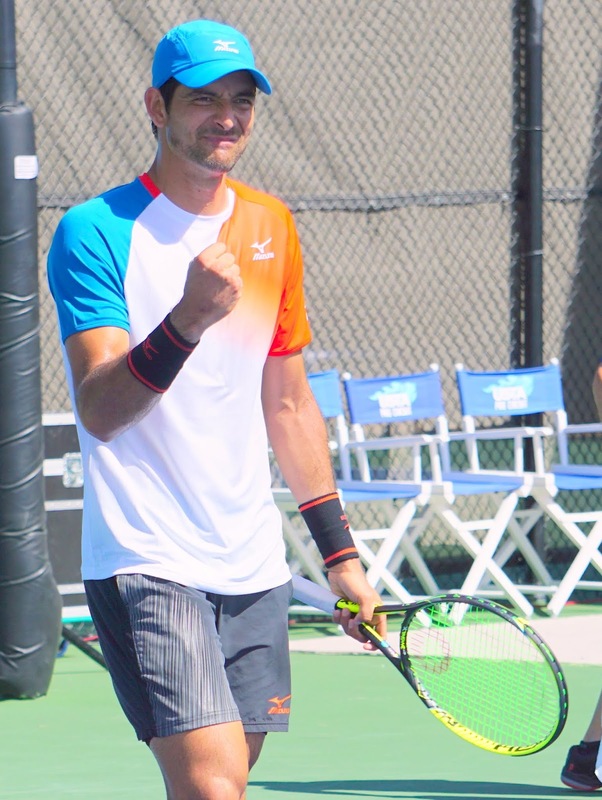 Duckworth reached the third round in Washington on the elite ATP Tour in early August and won the $50,000 Cary (N.C.) Challenger two weeks ago. His last three matches in Cary were moved indoors because of light rain from Hurricane Florence. After his ordeal, Duckworth is enjoying tennis more than ever. "I always loved tennis, and I've never really taken it for granted," he cautioned. "But I guess now -- I don't want to say I appreciate it more because I did really appreciate it -- but I'm just trying to soak up every tournament I go to. Every time I'm practicing and playing matches, I'm thinking, Gee, this is so much better than being on the operating table or doing rehab." Here are the Tiburon singles and doubles draws and Friday's schedule. The tournament is being streamed live. Admission is $25 on Friday, $30 on Saturday and $35 on Sunday ($55 for a Saturday-Sunday pass).